First, cut a 5 3/4" x 9" piece of Stampin' Up! Wild Wasabi card stock and fold it in half for the base and a 4 3/8" x 5 5/8" piece of Stampin' Up! Blushing Bride for the front layer. Next using a Stamp a ma jig stamp the following images in Blushing Bride ink: the netting background that's behind the flower and butterfly then the background phrase. Then stamp the dashed line along the bottom and the flower in Stampin' Up! Blackberry Bliss ink. Next double stamp the ferns (ink your stamp, stamp on a piece of scrap paper then on your project without re-inking) in Wild Wasabi ink and stamp the post mark as you normally do in Wild Wasabi. Then stamp the sentiment in Blackberry Bliss ink. 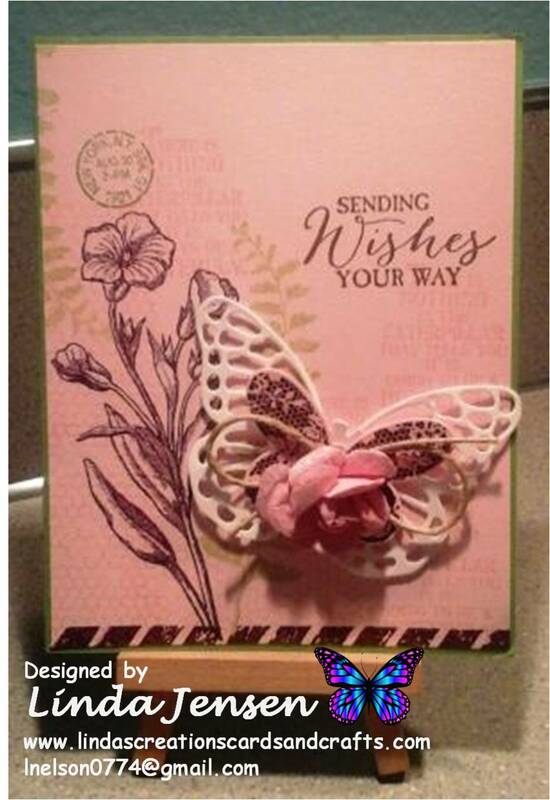 Next, on a separate piece of Blushing Bride card stock, stamp the lacy butterfly in Blackberry Bliss and cut it out with a Stampin' Up! Bold Butterfly Framelits Die. Then cut out out the larger white butterfly with a Stampin' Up! Butterflies Thinlits Die and attach it beneath the lacy pink one with a mini pop dot. Next tie a piece of Stampin' Up! hemp twine in a bow and attach it above the lacy butterfly followed by a rose sticker. 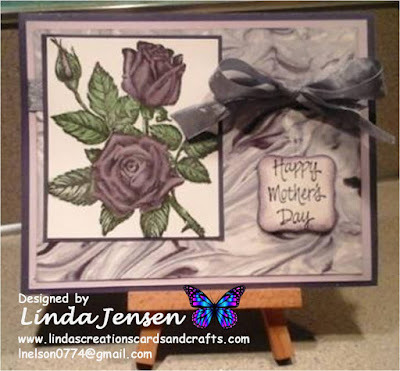 Then attach the front layer to the base and the butterflies to the front layer with mini pop dots and enjoy!